Like you, we love flowers. As the days grow short and we spend more time indoors, we enjoy arrangements of pretty stems that have been preserved from summer’s abundance. No, we don’t grow them all, but someone does! These are not made of materials like silk. There is nothing faux about them. They are all natural, gathered from growing plants. The difference is that they outlast fresh cut flowers. Some are flowers, stems, and leaves, and some are dried seed pods. We even use some durable fresh material like pumpkins and gourds. And we may mix in some surprises like pheasant feathers and dried mushrooms. Perfect for the lake or beach house, or year-round home, they need no attention or freshening in a season overflowing with lists of things to do. If you don’t want the commitment needed for living foliage plants in your home or office, let these fill the yearning you feel for plants indoors. Keep them away from direct sun that can fade them, and they will “live” long. We have gathered a good selection of different materials for you to arrange yourself. Of course, you can also take home an arrangement we have put together. 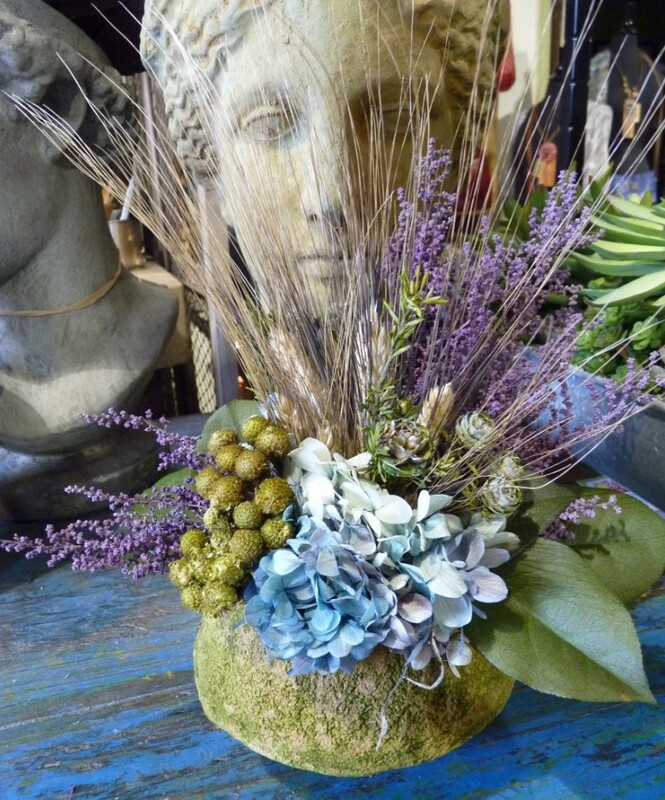 If you would like a custom arrangement, select one of our containers, or bring your own. Remember, it doesn’t need to hold water. Take a photo of the room to give us an idea of the colors and size that you need. We’ll work with you to create what you need. We have preserved a bit of summer for you to take home. Whether you are decorating for family gatherings during the holidays to come, or simply want something lovely on your table or beside your favorite chair, consider using bouquets of dried materials.